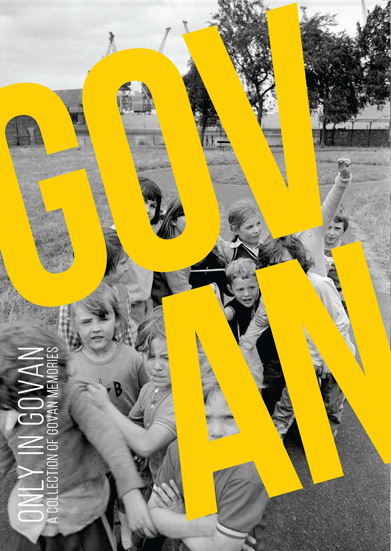 “Only in Govan – A Collection of Govan Memories” is now available in hard copy and to download.This collection of Govan memories was kindly shared through a series of conversations, workshops and encounters. The reminiscences are heart-filled, playful and cast light on the humour and human spirit of the special place that is Govan. From the autumn of 2013 to the spring of 2014, the project, led by icecream architecture for the Govan Cross Townscape Heritage Initiative, followed an engaging journey that led to the crafting of this wonderful book. Every sentence originates from someone living in Govan or with a strong connection to the community. We hope you find something inside the book that inspires, that brings on a chuckle or that reminds you of the warmth, wit and resilience of the people of Govan. By commissioning “Only in Govan” the THI hopes to preserve a small part of the cultural heritage of Govan by capturing the stories and reflections of the generations who have lived, worked and visited Govan in recent memory. Govan Old, Fairfield, Govan Housing Association, Elderpark Housing Assocation, Brechins Bar, Elder Park Library, Ferry, The Portal, Pearce Institute, Cafe 13, Riverside Hall, Riverside Museum, Orkney Street Enterprise Centre, Ibrox Library. Go on, get into Govan!